88 min. 20th Century Fox. Director: Wes Anderson. Cast: George Clooney, Meryl Streep, Jason Schwartzman, Bill Murray, Wallace Wolodarsky, Owen Wilson, Willem Dafoe. "Boggis and Bunce and Bean/One Fat,/One Short,/One Lean,/These Horrible Crooks/So Different in Looks/Were None the Less Equally Mean." With these words direct from the pages of Roald Dahl, director Wes Anderson kicks off his stop-motion-animated adaptation Fantastic Mr. Fox. Though the film, by necessity, expands Dahl's original story and fuses it to the sensibility of Anderson, author and auteur share a common tone of twisted twee that makes Fantastic Mr. Fox so seemingly obvious that one might ask what took Anderson so long. Certainly, Anderson's affection for and scrupulousness to his source is apparent; he photographed every inch of Dahl's residence, Gypsy House, in order to use it as a model for Mr. Fox's home and office. The film's dollhouse design (by Nelson Lowry, under Anderson's watchful eye) is a sight to behold, and the animators capture and enhance the quirks of Anderson's idiosyncratic casting and the comic timing that comes with it, while enabling Anderson to stick to his framing and editing rhythms. Anderson's love of cutaway architecture fits the fox-warren geography and the story proves surprisingly welcoming to infusions of carefully chosen vintage pop music (from The Beach Boys' "Heroes and Villains" to The Bobby Fuller Four's "Let Her Dance"). Dahl's story concerns Mr. Fox's thefts from and evasion of Boggis, Bunce and Bean. The witty and urbane Mr. Fox cuts a natty and dapper figure, so naturally Anderson cast George Clooney, oft pegged as the American heir to Cary Grant. Mr. Fox is supposed to be retired from thief life, having taken on writing the "Fox About Town" column in the local Gazette, playing house-husband to Mrs. Fox (Meryl Streep) and father to surly adolescent Ash (Jason Schwartzman). The awkward Ash lives in pouty jealousy of his ultra-capable cousin Kristofferson Silverfox (Eric Chase Anderson), while Mr. Fox is too busy worrying about his own mortality to notice. He's beyond a mid-life crisis; as he puts it, "Honey, I am seven fox years old. My father died at seven and a half. I don't want to live in a hole anymore, and I'm going to do something about it." That something is moving the family into a tree adjacent to Boggis, Bunce and Bean, against the advice of his attorney Badger (Bill Murray). The new location, of course, also affords a prime position for Mr. Fox to steal from the local businessmen, a secret that would make Mrs. Fox none too happy were she to discover it. And when Ash gets wind of his father's latest shenanigans, he realizes he hasn't been invited to participate, as has Kristofferson. Oh, the indignity! But for all the anthropomorphization, Anderson brilliantly insists upon the characters' primal animal nature, as they hilariously break out of human cadences to tear toothily into flesh or to snarl threateningly at each other. That Mr. Fox is capable of what he calls "pure wild animal craziness" as well as a signature, rakishly human whistle and tongue click reminds viewers that despite our own domesticization, we have an animal side as much as Mr. Fox does. All's well that ends well, of course, with Mr. Fox discovering the proper priority of family while also teaching his loved ones that adventure is a way of life. 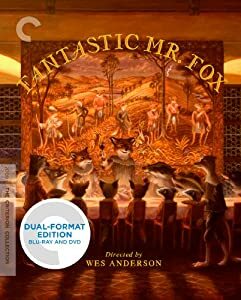 Criterion expands its near-complete collection of Wes Anderson's films with its Dual Format Edition (Blu-ray and DVD) of Fantastic Mr. Fox. Given the recent vintage of the flm, one would be hard-pressed to determine the difference between Criterion's hi-def transfer and the one issued four years ago by Fox, but fans have every reason to snag the Criterion edition anyway, in part because it's "director-approved" from Criterion lover Anderson, in part because of the slightly higher bit rate afforded the feature, and in large part because of the battery of bonus features in this edition. The picture looks fantastic, especially in its generous textures and rich color, and the DTS-HD Master Audio 5.1 mix is plenty perky, lively in rear channels, and full-bodied in its treatment of the source music. The bonus features kick off with the main draw: an exclusive audio commentary with Anderson, who discusses the film's inception and the material's appeal, while also itemizing the final product's many film allusions. Playback options also include an "Introduction" (1:12, HD) and the Storyboard Animatic for the entire film (1:15:09, HD). The Making of Fantastic Mr. Fox (unfortunately sans "Play All" option) comprises voice-recording footage (7:44, HD), puppet construction (3:53, HD), stop-motion setups (1:31, HD), visit to the studio (10:27, HD), time-lapse photography (2:23, HD), music recording (4:54, HD) and miniature objects (1:16, HD). Also included are a gallery of set photography by Ray Lewis, animated acceptance speeches for nominations and wins at the National Board of Review and the Academy Awards (1:17, 1:22, :27, HD), and "Roald Dahl Reads Fantastic Mr. Fox" (53:20, HD). The six "Publicity Featurettes" from the previous 20th Century Fox release (see below) return here: "The Look Of Fantastic Mr. Fox" (8:12, HD), "From Script To Screen" (7:01, HD), "The Puppet Makers" (8:21, HD), "Still Life (Puppet Animation)" (7:23, HD), "The Cast" (6:34, HD) and "Bill And His Badger" (7:37, HD). Produced by Imagine Television, the 2005 documentary Fantastic Mr. Dahl (1:01:26) digs into Dahl's personal archives, interviews his family, and presents vintage interview footage of the author. Rounding out the extras are a presentation of Dahl's Manuscripts (eighteen pages of the Fox draft and correspondence with editors), "Discussion and Analysis" (11:27, HD) by kids Jake Ryan and Jeremy Logan, a "Sony Robots Commercial" (1:01, HD) directed by Anderson, and brief Dahl interview clip "Witch's Tree" (1:43, HD). Oddly, the film's theatrical trailer, found on the previous release, hasn't been included here. The whole magillah comes in a digipack housing the Blu-ray, two DVDs replicating all the content found on the Blu-ray, and a booklet with a new essay by critic Erica Wagner; a 2002 article, by Anderson, on Dahl’s Gipsy House; White Cape, a comic book used as a prop in the film; and drawings, original paintings, and other ephemera. 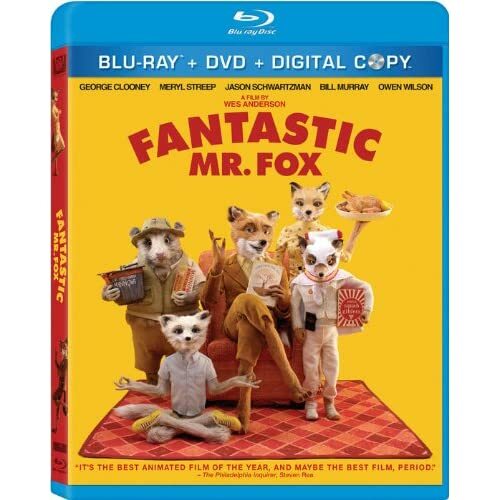 Fox's Blu-ray + DVD + Digital Copy Special Edition of Fantastic Mr. Fox features a pixel-perfect digital-to-digital transfer. Though that description might conjure an image of a ultra-sharp sheen, Fantastic Mr. Fox retains its homemade look, delicately lit and, above all, finely textured. This will be the disc in your collection to show off Blu-ray's gift for textures, in every fabric and hair. The DTS-HD Master Audio 5.1 surround mix can likewise be considered a definitive presentation, though the film's audio doesn't pop nearly as much as its picture. 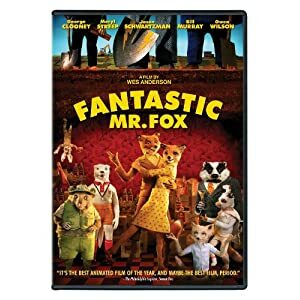 The primary feature, "Making Mr. Fox Fantastic" (44:48, HD), is a deluxe making-of documentary in several chapters, with a "Play All" option. We get to hear how Dahl's story (and world) were adapted and go behind the scenes of the stop-motion production. Interviewed are writer/director Wes Anderson, producer Jeremy Dawson, Roald Dahl's widow Felicity Dahl, production designer Nelson Lowry, director of photography Tristan Oliver, animation director Mark Gustafson, producer Allison Abbate, animator Mark Waring, Bill Murray, puppet fabrication supervisor Andy Gent, Jason Schwartzman, and animator Kim Kaukelerre. Also on hand are the swift tutorial "A Beginner's Guide to Whack-Bat" (1:12, HD); the brief promo "Fantastic Mr. Fox: The World of Roald Dahl" (3:00, HD) with Anderson and Felicity Dahl; and the film's "Theatrical Trailer" (2:27, HD). All site content © 2000-2019 Peter Canavese. Page generated at 04/18/2019 01:41:59AM.